Born in Handsworth, Birmingham in 1940 some of Stuart’s earliest memories are of Dinky Toy cars. 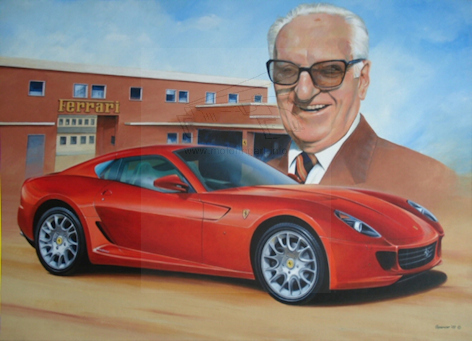 The car interest developed and intensified, lasting throughout his life with particular focus on design and motor sport. His other interests include music, mainly big bands, mainstream jazz and blues.</p> <p>Stuart left Technical College in the mid-1950s and then became apprenticed to an art studio designing stationary whilst continuing to study at Birmingham College of Art in the evening. Soon after completing his apprenticeship, to broaden his skill base, he joined a small commercial art studio specialising in industrial accounts and airbrush artwork. In 1962 Stuart married Mary, his toughest art critic. In 1966 Stuart joined Rootes Motors in their Body-in-White Engineering Department as a technical illustrator working for ex. Daimler Chief Body Draughtsman “Jim” Rogers. Rootes was taken over by Chrysler who moved the Studios and Engineering Research Departments a mile across Coventry to Whitley. Peugeot SA acquired Chrysler UK. Remaining on the Whitley site Stuart transferred to Peugeot’s Advanced Design Studio. This was a particularly fortuitous move since Stuart was now working alongside American Designers who had stayed over from Chrysler and were taught at the Pasadena Art Center in California. Over a three-year period one of these Americans, Don Wyatt, taught Stuart more about colour and tonal values than at any other period in his life. In 1983 when Peugeot relocated the studio to Paris, Stuart, along with several others, joined the Jaguar Styling Department at Browns Lane. 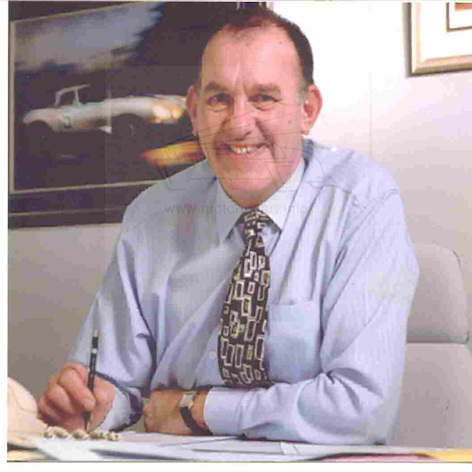 In 1985 Jaguar purchased the Whitley site which they modified and relocated their Engineering Research and Styling which was at that time under the inspirational leadership of the Late Geoff Lawson. Within two years Stuart was promoted to Model / Studio Manager, after Geoff’s sudden, untimely death, Ian Callum was appointed as Director, Jaguar Design and added the Aston Martin Studio to Stuart’s list of responsibilities. In 2002 Stuart retired from Jaguar to develop his interests in motor sport and painting. Whilst Stuart was at Chrysler UK the British Motor Industry was going through a very turbulent time. During the same period, the Spencer household went through a population explosion of three children in twenty seven months. As an insurance policy he started to paint rally cars and before long he was receiving commissions from major teams. To promote this work Mary formed the company “Spencer Trauts”. The use of a pseudonym came when a journalist wrote a feature article on Stuart for the RAC Rally Programme. Stuart was reluctant to use his name for fear of repercussions with the day job so informed the journalist his name was Trauts (Stuart reversed). The business was developed throughout the Chrysler/Peugeot years with 18 open issue prints published which are still being requested 30 years later. The involvement with competition cars, rally and saloons in particular, led to him taking holidays and going testing with teams highlights include being driven at seven tenths by Tony Pond and Henri Toivonen. Throughout this period he was also developing his interest in playing music, having to have two estate cars, one for transporting the family the other a drum kit. Among the many memorable moments in this mini career working with Duke Ellington’s singer Adelaide Hall and gigs with Diana Dors have outstanding memories. Some of Stuarts motor industry highlights include such diversities as artwork, a building and a show car…….. The artwork was a request from Jim Randle, Jaguar’s then Director of Engineering, to produce a cutaway of the XJ220 prototype. This was particularly difficult as it had to be completed out of company hours and before the car was assembled. Over 250,000 prints of this painting were published. The building was a request from Geoff Lawson to design and oversee the construction of Jaguar’s first Advanced Design Studio; surely this is every artists dream, a new studio with a healthy budget from a blank sheet of paper. At Jaguar Stuart was responsible for the build of eight show cars, his most satisfying was to manage the modeling and construction of the F-Type showcar. In 1992 during a mid life crisis he purchased a 1986 Corvette Indy Pace Car Replica with which he terrorises the inhabitants of Warwickshire’s country roads on early morning blasts, never in the wet but always with the top down regardless of the time of year. Stuart usually paints with acrylics expanding his subject matter to encompass portraits, often with cars. He has received numerous interesting commissions two for Sir Nick Scheele, recently retired C.O.O. Ford Motors. Another for General Motors was presented to Wayne Cherry upon his retirement as Design Vice President. He joined the Guild of Motoring Artists in 1995 and became a committee member in 2005. He has exhibited at the Detroit Henry Ford Museum, both the Goodwood Festival of Speed and Revival, Alexander Palace, The British Museum of Transport, British Motor Shows, Donington, Brooklands and Silverstone Raceways. The Jaguar Daimler Heritage Trust Museum where he works as a volunteer when time allows.